There is nothing more annoying than coming back to continue reading your book only to realize you lost the page you were currently in. That is why it is always handy to have a couple of bookmarks lying around that you can easily tuck into your book to mark the page you want to return to after other tasks and activities are completed. But aside from that, a bookmark can also be used for various reasons and purpose. Learn more as you scan through the bookmark templates and examples in this article. Contrary to what you may think, a bookmark can also be used as a keepsake to help preserve precious memories. 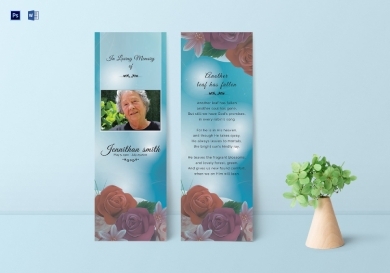 Using a bookmark as a way to remember and commemorate someone’s passing will help people have other things to look back to when they miss the people who have already passed. 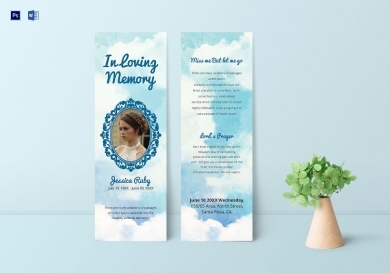 You can use this editable memorial bookmark template to include images, favorite quotes, poems, etc. of your deceased loved one to give to friends and family members on the day of the memorial as his or her memento. People have different ways of coping loss, some tend to sulk for a longer period of time while others immediately dive back into the natural order of their lives. Regardless of that, it is healthy to look back and express your sadness brought about the loss of a loved one. A good reminder to use for this is having a memorial bookmark that encapsulates how the departed has lived his or her life. If you are looking for a template for that, you can download this one and edit in Adobe Photoshop or MS Word to include the details that you want. DIY-ing your personal bookmark means that you get to decide how it will look like with your preferences as the sole basis. 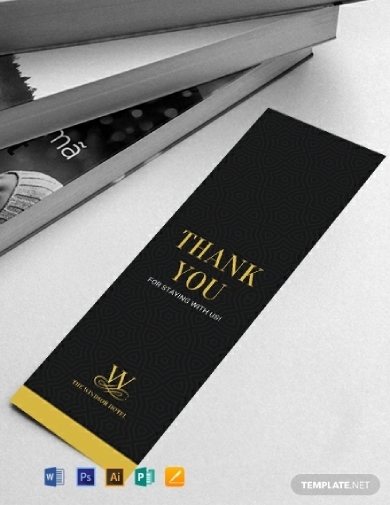 You can get a good head start in creating one by using this sleek black-and-gold bookmark template. It can even be edited to suit the purpose you will be using it for, for example, as a tag examples on a favor bag or a card to say thanks to important people who have helped you, and so on. You can download this template for free from this article. 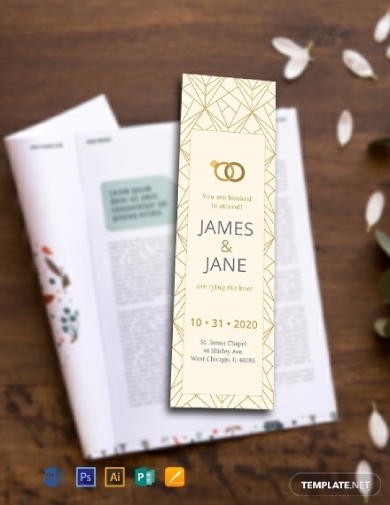 Stray away from the norm when sending save-the-date invitations to friends and family members you want to invite to your wedding by using a bookmark. The bookmark can still contain all the necessary information such as the date, time, location, theme, etc. for the wedding. 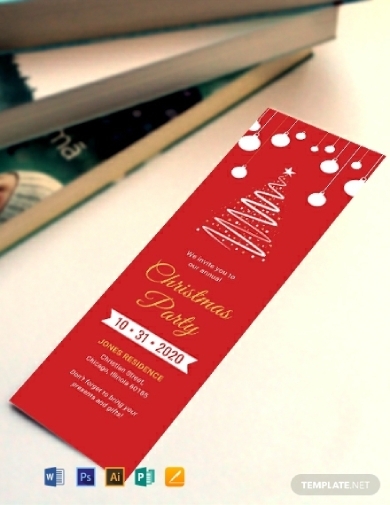 You can customize this save-the-date bookmark template to suit the overall theme of the event. 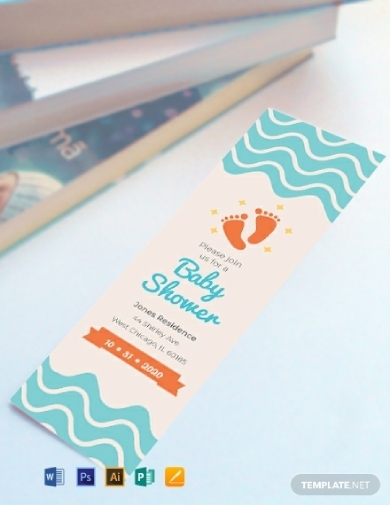 Similar to a save-the-date invitation, you can also utilize a bookmark as the baptism invitation and at the same time a keepsake from the event. A baptism bookmark specifically used as an invitation should still include all the contents of a usual invitation. If you are looking for an adorable and creative template for that, you can download this template that you can easily edit in Adobe Illustrator and Photoshop, MS Word and Publisher, and Apple Pages. If you think sports and reading don’t coincide, you’re wrong. In order to be an effective athlete or to achieve the results you want when you start working out, you need to do lots and lots of research to understand what you need to do, why, and how you can constantly improve. 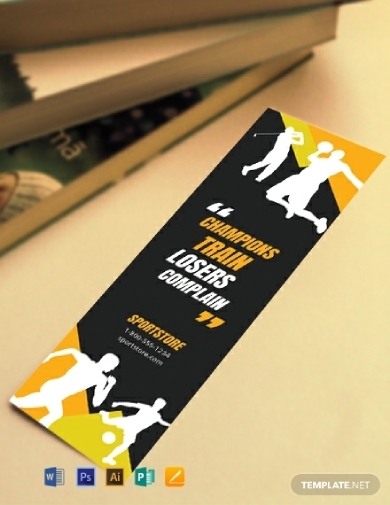 Thus, as a business focusing on sports, you can use a bookmark to give to customers as a thank-you gift. You can download this template and edit to include the details that you want, e.g. a motivational quote and your business details. 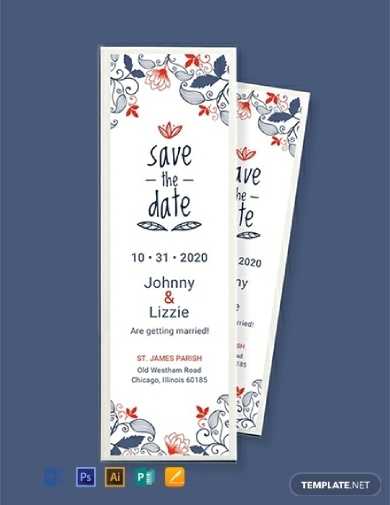 Save up on your wedding expenses by using a simple bookmark as your wedding invitation. Instead of using a handful of cards for the invitation, use a bookmark to only present the important information about the event such as the name of the couple, type of event, date and time, complete location, dress code, etc. You can download this template to make use of its elegant design, original artworks and illustrations, unique fonts, and so much more. This is also easy to edit; thus, you can make sure your theme and preference are flawlessly incorporated. A bookstore and a bookmark is a match made in heaven. You can give a bookmark to customers who purchase from your bookstore as a token for their support. You know customers will actually use and love the bookmark since they have bought books and other materials from your store. Download this template for free from this article; this template features high-quality designs and layout that will surely carry out your brand identity effectively. Aside from the usual Christmas greeting card, you can always use other documents or media to spread the Christmas spirit to everyone. A bookmark with beautiful and intricate designs along with a warm message will surely be appreciated by your recipients. With that, you can use this charming Christmas greeting bookmark template that you can easily edit and use to send sincere greetings to your loved ones. A bookmark is a versatile tool that you can use for any reason or purpose, as you may have seen in all the provided templates. 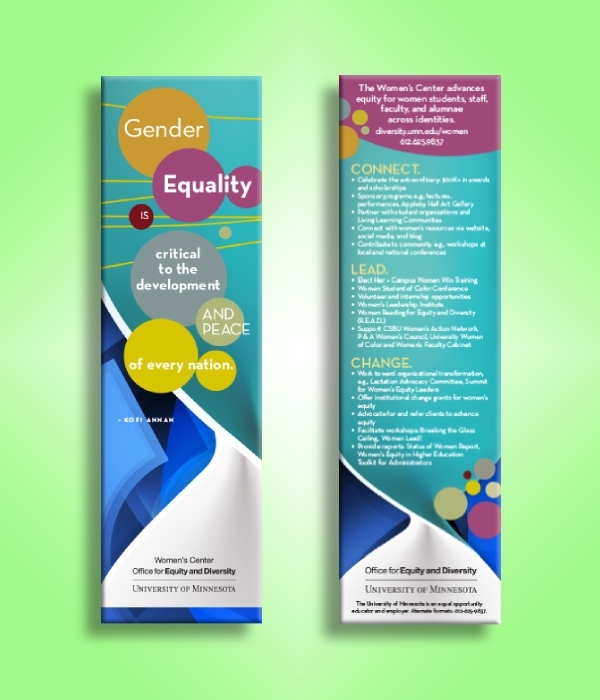 This particular bookmark example is used to support a campaign in a specific university. Since it is considerably smaller than a flyer or a poster templates, it is a cost-effective alternative in conveying the message you want people to know about the campaign so long as you provide enough information in it. This bookmark example is also used to help further the message of acceptance of the LGBTQ+ community. 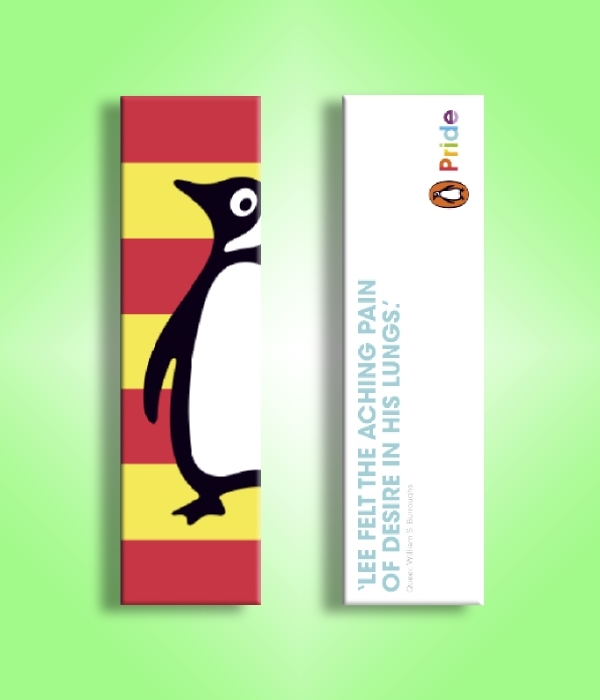 The big-name publishing house Penguin Books made this bookmark to help marginalized LGBTQ+ members feel pride with their identity. 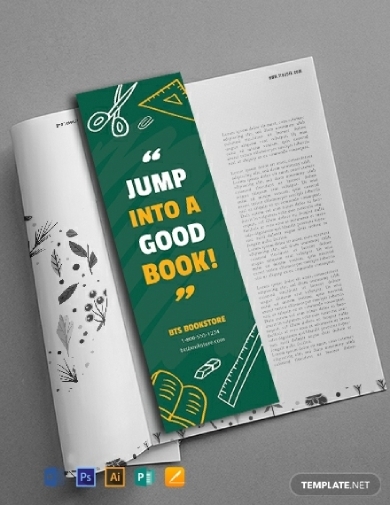 If you want to make use of a bookmark for similar reasons, you can take inspiration with how this one was designed and formatted to make sure your message is conveyed effectively.